Not to be confused with Kang Shien. Kang Sheng (Chinese: 康生; pinyin: Kāng Shēng; c. 1898 – 16 December 1975) was a Communist Party of China (CPC) official best known for having overseen the work of the CPC's internal security and intelligence apparatus during the early 1940s and again at the height of the Cultural Revolution in the late 1960s and early 1970s. A member of the CPC from the early 1920s, he spent time in Moscow during the early 1930s, where he learned the methods of the NKVD and became a supporter of Wang Ming for leadership of the CPC. After returning to China in the late 1930s, Kang Sheng switched his allegiance to Mao Zedong and became a close associate of Mao during the Anti-Japanese War, the Chinese Civil War and after. He remained at or near the pinnacle of power in the People's Republic of China from its establishment in 1949 until his death in 1975. After the death of Mao and the subsequent arrest of the Gang of Four, Kang Sheng was accused of sharing responsibility with the Gang for the excesses of the Cultural Revolution and in 1980 he was expelled posthumously from the CPC. Kang Sheng was born in Dataizhuang (大臺莊) (administered under Jiaonan County since 1946), Zhucheng County to the northwest of Qingdao in Shandong Province to a landowning family, some of whom had been Confucian scholars. Kang was born Zhang Zongke (simplified Chinese: 张宗可; traditional Chinese: 張宗可; pinyin: Zhāng Zōngkě) but he adopted a number of pseudonyms – most notably Zhao Rong, but also (for his painting) Li Jushi—before settling on Kang Sheng in the 1930s. Some sources give his year of birth as being as early as 1893, but it has also been variously given as 1898, 1899 and 1903. Kang received his elementary education at the Guanhai school for boys and later at the German School in Qingdao. As a teenager, he entered into an arranged marriage with Chen Yi, in 1915, with whom he had two children, a daughter, Zhang Yuying, and a son, Zhang Zishi. After graduating from the German School, Kang taught in a rural school in Zhucheng, Shandong in the early 1920s before leaving, possibly for a sojourn in Germany and France, and ultimately for Shanghai, where he arrived in 1924. After arriving in Shanghai, Kang enrolled in Shanghai University, a former teacher's college that was officially funded by the Kuomintang but had come under the control of the CPC and the intellectual leadership of Qu Qiubai. After about six months at the university, he joined the Communist Party Youth League and then the Party itself, although the circumstances of his membership and sponsorship remains something of a mystery. At the direction of the Party, Kang worked underground as a labor organizer. He helped organize the February 1925 strike against Japanese companies that culminated in the May 30th Movement, a huge Communist-led demonstration, and brought Kang into close contact with Party leaders Liu Shaoqi, Li Lisan and Zhang Guotao. Kang participated in the March 1927 worker's insurrection alongside Gu Shunzhang and under the leadership of Zhao Shiyan, Luo Yinong, Wang Shouhua and Zhou Enlai. When the uprising was put down by the Kuomintang with the crucial assistance of Du Yuesheng's Green Gang in the Shanghai massacre of April 12, 1927, Kang was able to escape into hiding. Also in 1927, Kang married a Shanghai University student and fellow Shandong native, Cao Yi'ou (born Cao Shuqing), who was to become a lifelong political ally. He entered the employment of Yu Qiaqing, a wealthy businessman with strong Kuomintang sympathies, as Yu's personal secretary. At the same time, Kang remained an active but secret Party organizer, and was named to the Party's new Jiangsu Provincial Committee in June 1927. In the late 1920s, Kang worked closely with Li Lisan, a favorite of the Comintern, who had been made head of the Propaganda Department at the CPC's Sixth Congress, which for security reasons and proximity to the Comintern's congress was held outside Moscow in mid-1928. Several months after the Sixth Congress, Kang was named director of the Organization Department of the Jiangsu Provincial Committee, which controlled personnel matters. After Li Lisan's adventurism and the failed Changsha operation of June 1930 lost Li the support of the Party, Kang moved adroitly to align himself with the Comintern's new favorite, Wang Ming, and Pavel Mif's young students from Sun Yat-sen University, later known as the 28 Bolsheviks, who took control of the Party Politburo at the Fourth Plenum of the Sixth Central Committee on January 13, 1931. Kang allegedly demonstrated his loyalty to Wang Ming by betraying to the Kuomintang secret police a meeting convened on January 17, 1931 by He Mengxiong, who had been strongly opposed to Li Lisan and was disgruntled by Pavel Mif's high-handed role in securing the ascendancy of Wang within the Chinese Communist Party. On the night of February 7, 1931, He Mengxiong and 22 others were executed by the Kuomintang police at Longhua, Shanghai. Among those murdered were five aspiring writers and poets, including Hu Yepin, lover of Ding Ling and father of her child, later canonized as a martyr by the Party. The April 1931 arrest and defection to the Kuomintang of Gu Shunzhang, former Green Gang gangster and member of the Party's Intelligence Cell, led to serious breaches in Party security and the arrest and execution of Xiang Zhongfa, the Party's General Secretary. 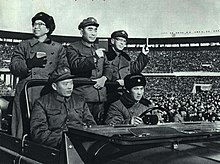 In response, Zhou Enlai created a Special Work Committee to oversee the Party's intelligence and security operations. Chaired by Zhou personally, the committee included Chen Yun, Pan Hannian, Guang Huian and Kang Sheng. When Zhou left Shanghai for the Communist base in Jiangxi Province in August 1931, he left Kang in charge of the Special Work Committee, a position he held for two years. In this role, Kang was "in charge of the entire Communist security and espionage apparatus, not only in Shanghai but throughout KMT China." In July 1931, Wang Ming removed himself to Moscow and assumed the position of chief Chinese representative on the Comintern. Kang and his wife Cao Yi'ou followed two years later. Kang remained in Moscow for four years, acting as Wang's deputy on the Comintern, returning to China in 1937. While in Moscow, Kang was elected a member of the Politburo of the CPC, perhaps as early as 1931 but more probably in January 1934. [T]he Long March helped the Chinese Communist Party to achieve a greater independence of Moscow. Everything tended in the same direction – Mao Zedong's appointment as Chairman of the Party, happening as it did in unusual conditions, practical difficulties in maintaining contact, the Comintern's tendency to remain in the background to help the creation of popular fronts, under cover of patriotism or ant-fascism. In fact, after the Zunyi Conference, the Russians seem to have had less and less influence in the Chinese Communist Party's internal affairs. In light of more recent history, this was perhaps one of the major consequences of the Long March. Wang Ming's influence over the main Communist forces was minimal after Mao Zedong's emergence from the Zunyi Conference of January 1935 as the undisputed head of the Party. From Moscow, Wang and Kang did seek to maintain control over Communist forces in Manchuria, which were ordered by them to conserve their strength and avoid direct confrontation with the Japanese army. This directive, which Kang later denied even existed, was resisted by some Manchurian leaders and later criticized by Mao Zedong as evidence of Wang Ming having stifled Manchuria's revolutionary potential. Kang gained great power from the Elimination Office, which he used to silence opponents and witnesses to any embarrassing episodes in his past, especially his arrest in Shanghai. … This was not the first time the Chinese in Moscow had fallen victim to purges. Soviet authorities had made numerous arrests at Moscow Sun Yat-sen University during the late 1920s; students disappeared into the night, never to be seen again. But Kang worked his own variation: in the past, the Chinese had been purged by the Soviets; now, under Kang, they were liquidated by their fellow Chinese. Stalin was more tolerant of the Chinese in Moscow than he was of other foreign Communists, who were purged along with their Soviet comrades. This may have been motivated by a concern about the potential threat of a Japanese invasion of the Soviet Far East. In any case, at this time Stalin began to promote the idea of a united front of the Chinese Communist Party and the Kuomintang against the Japanese, a policy that Wang Ming and Kang quickly endorsed. In November 1937, following the Marco Polo Bridge Incident and the Japanese invasion of China, Stalin dispatched Wang and Kang to Yan'an on a specially provided Soviet plane. It can be said without any shadow of a doubt that at that time Kang Sheng was playing a multiple game. On the one hand he was humoring Stalin, but at the same time he was betraying his confidence. Similarly, he had made contact with the Trotskyists, and had considered joining their movement, but he had also taken steps to infiltrate and sabotage their Fourth International…. Tito made these comments to Hua Guofeng on his only visit to China, in 1977 after Kang was dead, and certainly had his own agenda in doing so, but as Faligot and Kauffer remark, "[i]n any case, Tito certainly got the measure of Kang's psychology: a multifaceted game of mirrors was certainly his style, even in the 1930s." When Kang Sheng arrived in the Party's redoubt at Yan'an in late November 1937 as part of Wang Ming's entourage, he may have already realized that Wang Ming was falling out of favor, but he initially supported Wang and the Comintern's efforts to guide the Chinese Communists back into line with Soviet policy, especially the need to align with the Kuomintang against the Japanese. Kang also brought Stalin's obsession with Trotskyism to play in helping Wang defeat the efforts of Zhou Enlai and Dong Biwu to bring Chen Duxiu back into the Party. Kang Sheng was a valuable catch for Mao as he strove to consolidate the power he had won at the Zunyi Conference in January 1935. Kang could betray all the secrets of Wang Ming and his supporters. He was au fait with Moscow politics and police methods, and sufficiently fluent in Russian to act as a major contact with Soviet visitors. He had absorbed sufficient Marxism-Leninism and Stalinist polemicizing to affect the patina of a theorist, and he was a fluent writer. Kang acted decisively to protect Mao and rebut the charges against Jiang Qing. Invoking his background as head of the Organization Department and as an expert on security and espionage matters, Kang vouched for Jiang Qing. She was a Party member in good standing, he declared, and had no affiliations that would bar marriage to Mao. Kang's personal knowledge of Jiang Qing's past was fragmentary and certainly insufficient to allow him to prove that she was not a KMT agent, but he doctored her record, destroyed adverse material, discouraged hostile witnesses, and coached her on how to answer the probing questions of high-level interrogators who hoped to discredit Mao. This episode is believed by many to have been key to Kang's future success, which depended not only on his considerable talents but also on his relationship with Mao. In addition to politics, Kang and Mao also shared an interest in classical culture, including poetry, painting and calligraphy. Mao's relationship with Kang, in Yan'an and later, was mainly based on political calculation. Kang's familiarity with Wang Ming enabled him to provide Mao with valuable information about Wang's subservience to the Soviets. Although cadres such as Chen Yun, who had been in Moscow with Wang and Kang, were aware of Kang's previous slavish support for Wang, Kang strenuously sought to change that history and obscure previous affiliations. In addition, Mao, who in these years had not yet visited the Soviet Union, used Kang during this period as a valuable source of information about Soviet affairs. Mao was also suspicious of the Russians and, soon after aligning himself with Mao, Kang also began to speak out against the Soviet Union and its agents in China. Peter Vladimirov, the Comintern agent sent to Yan'an, recorded that Kang kept him under constant surveillance and even forced Wang Ming to avoid meeting him. Vladimirov also believed that Kang delivered biased reports of Soviet affairs to Mao. Once again, the ECCI and, standing behind it, Stalin himself, helped Mao to consolidate his power. This time they even overdid it. Mao did not view Kang Sheng, who had already openly switched to his side, nor several of these other party officials [named in the ECCI Personnel Department memorandum] as his foes. He even tried to defend Kang Sheng in one of his letters to [Georgii] Dimitrov. "Kon Sin [Kang Sheng]," Mao wrote, "is reliable." While in Yan'an, Kang oversaw intelligence operations against the Party's two principal enemies, the Japanese and the Kuomintang, as well as potential opponents of Mao within the Party. Chang and Halliday write that "Shi Zhe observed that Kang was living in a state of deep fear of Mao in this period" because of his murky past, which had been raised with Mao in many letters from cadres and by the Russians, yet "[f]ar from being put off by Kang's murky past, Mao positively relished it. Like Stalin, who employed ex-Mensheviks like Vyshinsky, Mao used people's vulnerability as a way of giving himself hold over subordinates." Vladimirov believed that Kang was behind, at Mao's behest, the attempt by Li Fuchun and Jin Maoyao to murder Wang Ming by means of mercury poisoning, although this claim remains controversial. China's wartime existential crisis provided a perfect excuse for the rival, yet parallel, states [in Chongqing, Nanjing and Yan'an] to use similar techniques, from blackmail to bombing, to achieve their ends, and mute the criticisms of their opponents. If each of them paid tribute to Sun Yat-sen in public, they also each paid court to the thinking and techniques of Stalin in private. Kang Sheng was the mastermind behind the "pain and friction" that underlay the Rectification process. He used a classic Soviet technique of accusing loyal party members of being Nationalist spies. Once they had confessed under torture, their confessions could then set off an avalanche of accusations and arrests. As the war worsened in 1943, and the Communist area become more isolated, Kang stepped up the speed and ferocity of the purges. Kang was sufficiently brutal in his methods to arouse the opposition of senior cadres, including Zhou Enlai, Nie Rongzhen and Ye Jianying. At the same time, Mao was not keen to have a single man in such a position of power. Accordingly, following the CPC's Seventh Congress in April 1945, Kang was replaced as head of both the Social Affairs Department and the Military Intelligence Department. [f]or many victims of Rectification, release and rehabilitation in 1945 after the Seventh Party Congress did not protect them permanently against Kang. During the Cultural Revolution, he searched many of them out, arrested them and charged them again with being traitors or renegades. A standard item of evidence used against them was a record of their arrest in Yan'an during the Rectification Movement – phony charges from the 1940s appeared twenty years later as "proof" of an individual's disloyalty. After his fall from the security posts, in December 1946 Kang was assigned by Mao, Zhu De and Liu Shaoqi to review the Party's land reform project in Longdong, Gansu Province. He returned after five weeks with the view that land reform needed to be more severe and that there could be no compromise with landlords. "Kang whipped up hatred for the landlords and their retainers. In the name of social justice, he encouraged the peasants to settle scores by killing landlords and rich peasants." [A]grarian reform cut a bloody swath through much of rural China. Squads of Communist enforcers were sent to the most remote villages to organize the local petty thieves and bandits into so-called land reform teams, which inflamed the poor peasants and hired laborers against the rich. When resentment reached fever pitch, peasants at staged "grievance meetings" were encouraged to relate the injustices and insults they had suffered, both real and imagined, at the hands of "the landlord bullies." Often these meetings would end with the masses, led by the land reform teams, shouting "Shoot him! Shoot him!" or "Kill! Kill! Kill!" The cadre in charge of proceedings would rule that the landlords had committed serious crimes, sentence them to death, and order that they be taken away and eliminated immediately. In November 1947, the CPC Politburo assigned Kang to inspect land reform in his home province of Shandong. Early in 1948, he was appointed deputy chief of the Party's East China Bureau, under Rao Shushi. Some commentators speculate that the private humiliation of being placed under a former subordinate may be one reason why Kang "fell ill" and largely disappeared from view until after Rao's fall in 1954. Of course, Kang may really have been ill. Mao's personal physician, Li Zhisui, later recorded that doctors responsible for Kang's treatment at Beijing Hospital told him that Kang was suffering from schizophrenia. Writing before Li's book was published, Byron and Pack offered other possible diagnoses based on symptoms Kang seems to have displayed, including manic-depressive psychosis and temporal lobe epilepsy. Kang's re-emergence on the political stage in the mid-1950s occurred at roughly at the same time as the Gao Gang-Rao Shushi Affair and the affair of Yu Bingbo. Faligot and Kauffer see these affairs as each showing signs of involvement by Kang Sheng, who they believe used them as means to return to power. The challenges that Kang faced during the early months of 1956 underscored the dangers he would have risked by continuing his retreat. As soon as he reappeared, Kang encountered serious problems that caused his position in the hierarchy to fluctuate dramatically. After the purge of Gao Gang and Rao Shushi in 1954, he had ranked sixth, below Chairman Mao, Liu Shaoqi, Zhou Enlai, Zhu De and Chen Yun. But in February 1956, just weeks after his return to public life, he was listed below Peng Zhen. By the end of April he was reported in tenth place, even below Luo Fu, the only member of the 28 Bolsheviks who still held a Politburo seat. Yet on May Day of 1956 – the international socialist celebration – Kang was suddenly back in sixth place. His position, at least going by public reports and official bulletins, remained unchanged from then until the Eighth Congress four months later. The reasons for Kang Sheng's reduction to alternate membership of the Politburo are not clear. …[T]he immediate reason for his demotion may have been the general revulsion against secret police within the communist bloc after Khrushchev's Secret Speech. Kang Sheng's emergence during the cultural revolution as one of the most important Maoist stalwarts suggests that…it is not unlikely that at the 8th Congress Mao saved Kang from even greater humiliation. The period of the Hundred Flowers was the time when the Chinese abandoned the Soviet model of development and embarked on a distinctively Chinese road to socialism. It was the time that China announced its ideological and social autonomy from the Soviet Union and its Stalinist heritage. It is a cruel and tragic irony that the break with the Stalinist pattern of socioeconomic development was not accompanied by a break with Stalinist methods in political and intellectual life. The latter was precluded by the suppression of the critics who had briefly "bloomed and contended" in May and June 1957. As noted in connection with the Yan'an Rectification Movement launched 15 years earlier, Kang Sheng played an important role in bringing Stalinist methods of repression to China. Kang was clearly a supporter of Mao during the period of the Great Leap Forward and its aftermath and, as MacFarquar writes, "[h]e was the beneficiary of Mao's practice of preserving and protecting those whom he trusted and relied upon, and for whom he saw a future use." As a result, Kang received a number of important positions during the late 1950s, including in 1959 responsibility for the Central Party School. Among Kang's most important activities in this period were those related to the deepening split with the Soviet Union, about which Mao and others regarded him as something of an expert. Among his assignments from the Politburo was to draft a long article that appeared in The People's Daily on December 29, 1956 under the title "More on the Historical Experience of the Dictatorship of the Proletariat" and which expressed the Party's position that Stalin's achievements overshadowed his mistakes. Kang visited the Soviet Union and various socialist countries in Eastern Europe on several occasions between 1956 and 1964, expressing increasing disdain for the "revisionist" policies of Nikita Khrushchev and Josip Broz Tito. In February 1960, as the Chinese observer at the conference of the Political Consultative Conference of the Warsaw Pact, Kang made what Jacques Guillermaz described as "a violent attack on the leaders of the United States, their feigned pacifism, their dream of 'peaceful evolution' of the socialist countries, and their repeated sabotage of disarmament." Byron and Pack describe the speech as "a subtle, almost sarcastic critique of Russian foreign policy that became a milestone in deteriorating Sino-Soviet relations." [u]nder the pretext of "combating the cult of the individual," certain persons are crudely interfering in the internal affairs of other fraternal parties and fraternal countries and forcing other fraternal parties to change their leadership in order to impose their own wrong line on those parties. Jacques Guillermaz asked rhetorically of this criticism, "[c]ould the Chinese really have been thinking of Enver Hoxha?" The Sino-Soviet rift and the obsession with Khrushchev's revisionism looms large in the coming of the Cultural Revolution, as Mao saw revisionism and de-Stalinization as a threat not only to his own position but also to the very survival of the Chinese Communist Party as a revolutionary force. Accordingly, an appreciation of Kang's role as a supporter of Mao's line in this period helps explain his return to very near the pinnacle of power a few years later. As an important ally of Mao Zedong's efforts to regain control of the CPC, Kang was an important enabler of and participant in the Cultural Revolution, later described by the CPC's Central Committee as having "lasted from May 1966 to October 1976" and as "responsible for the most severe setback and heaviest losses suffered by the Party, the state and the people since the founding of the People's Republic." The Central Committee resolution concluded that the Cultural Revolution "was initiated and led by Comrade Mao Zedong." In outlining the "errors" that had been made by Mao and others in the run-up to the Cultural Revolution, the Central Committee noted that "[c]areerists like Lin Biao, Jiang Qing and Kang Sheng, harbouring ulterior motives, made use of these errors and inflated them." Two months later, [Kang] moved to the Diaoyutai guest complex in the capital to mastermind a team of ideologues for the campaign against Soviet revisionism. The most cynical hit-man of Mao's Cultural Revolution swat team was now an agent in place, helping to initiate the domestic and foreign policies that were the prelude to that cataclysm. In January 1965, Mao suggested to the Party Politburo that the principal enemies of socialism in China were "those people in authority within the Party who are taking the capitalist road" and urged that the Party undertake a "cultural revolution." The Politburo established a five-man group, chaired by Peng Zhen, its fifth-ranking member and head of the Beijing Party Organization and mayor of the capital city. Kang Sheng was named a member of the group, which remained dormant for most of the year. In early 1965, Mao sent his wife Jiang Qing to Shanghai to light the first spark of what would become the Cultural Revolution, the campaign against Wu Han, the Vice Mayor of Beijing and the author of the 1961 play Hai Rui Dismissed from Office. The attack on Wu Han was an indirect attack on Beijing's mayor, Peng Zhen, a pillar of the establishment that Mao wanted overthrown. Kang's role in the subsequent purge of Peng was to co-lead with Chen Boda the prosecution of Mao's charge that "Peng Zhen, the Propaganda Department, and the Beijing Party Committee had shielded bad people while suppressing leftists." Following the purge of Peng Zhen in May 1966, the Central Committee later concluded, "Lin Biao, Jiang Qing, Kang Sheng, Zhang Chunqiao and others…exploited the situation to incite people to 'overthrow everything and wage full-scale civil war.'" With no limits imposed, no guidance offered, no one assuming responsibility for what occurred, and the Red Guards merely following their impulses, the assault upon their elders and the destruction of property grew completely out of control. 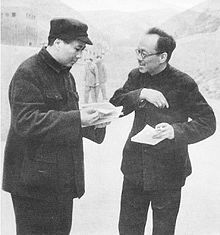 During the Cultural Revolution, Kang Sheng was actively involved in controlling the CPC propaganda apparatus, being appointed head of the "Central Organization and Propaganda Leading Group", while Yao Wenyuan as head of another "Propaganda Leading Group". In November 1970, Kang was elevated to head of the Propaganda Department. In 1968, Mao and other leaders finally began to rein in the Red Guards, with Kang Sheng playing a leading role. In January Kang denounced the Hunan shengwulian coalition of Red Guards as "anarchists" and "Trotskyists," launching a campaign of brutal suppression over the following months by the army and secret police. By July, when Mao joked with a group of Red Guard leaders that he himself was the "black hand" suppressing campus revolutionaries, the glory days of the movement were ending. In the turbulent years of the Cultural Revolution, Kang remained close to the pinnacle of power and, as the "evil genius" within the Central Case Examination Group (the "CCEG") established by the CPC Politburo on May 24, 1966, was instrumental in Mao's efforts to purge many senior Party officials, including his most senior rival within the Party, Liu Shaoqi. In the subsequent trial of the so-called "Gang of Four," one of the accusations leveled against Jiang Qing was that she conspired "with Kang Sheng, Chen Boda, and others to take it upon themselves to convene the big meeting [on July 18, 1967] to apply struggle-and-criticism to Liu Shaoqi, and to carry out a search of his house, physically persecuting the Head of State of the People's Republic of China." Xiao Meng testified at the trial that "the slander and persecution of [Liu Shaoqi's wife] Wang Guangmei was plotted by Jiang Qing and Kang Sheng in person." During its thirteen-year existence, the CCEG had powers far exceeding not only those once exercised by the Party's Discipline Inspection Commission and Organization Department, but even those of the central public security and procuratorial organs and the courts. The CCEG made the decision to "ferret out," persecute, arrest, imprison and torture "revisionist" [Central Committee] members and many lesser political enemies. Its privileged employees were the Cultural Revolution equivalent of Vladimir Lenin's Cheka and Adolf Hitler's Gestapo. Whereas the [Central Cultural Revolution Group] at least nominally dealt in "culture," the CCEG dealt exclusively in violence. The CCEG was established as an ad hoc body but soon became a permanent institution with a staff of thousands that, at one point, was investigating no fewer than 88 members and alternate members of the Party Central Committee for suspected "treachery," "spying," and/or "collusion with the enemy." During the Cultural Revolution, Kang abused his position to personal advantage. A gifted painter and calligrapher, he used his power to indulge his penchant for collecting antiques and works of art, notably inkstones. According to Byron & Pack, many of the Cultural Revolution leaders also used the lawlessness of the period to acquire for themselves objects seized from the homes of persons attacked by Red Guards. But Kang, in a series of visits to the Cultural Relics Bureau, "helped himself to 12,080 volumes of rare books – more than were taken by any other radical leader, and 34 percent of all the rare books removed – and 1,102 antiques, 20 percent of the total. Only Lin Biao, who, as Mao's designated heir, ranked second in the land, appropriated more antiques than Kang." Kang Sheng was instrumental in supervising the drafting of the new Party Constitution, adopted at the CPC's Ninth Congress in April 1969, which reinstated "Mao Zedong Thought" alongside Marxism-Leninism as the theoretical basis for the Party. The Congress elected Kang as one of the five members of the Politburo Standing Committee, along with Mao, Lin Biao, Zhou Enlai and Chen Boda. At the Ninth Congress, Kang Sheng's wife, Cao Yi'ou, was herself elected to the Central Committee. The Constitution drafted under Kang's supervision and adopted at the Ninth Congress stipulated that "Comrade Lin Biao is Comrade Mao Zedong's close comrade-in-arms and successor." Kang Sheng and Lin Biao were not close allies, although Kang had earlier assisted Lin in his successful efforts to remove Marshal He Long, a formidable rival to Lin's wish to control the People's Liberation Army. In the wake of Lin Biao's aborted coup attempt and death in September 1971, Kang was careful to distance himself from Mao's disgraced former heir and from Chen Boda, who had been closely aligned with Lin at the Central Committee meeting in Lushan in August 1970 and who was denounced after Lin's fall as "China's Trotsky." Efforts to link Kang to Lin Biao's plotting were unsuccessful and unsubstantiated. Ill with the cancer that would eventually kill him, Kang last appeared in public at the Tenth Congress of the CPC, in August 1973. The Tenth Congress adopted a new Constitution that removed the embarrassing reference to Lin Biao as Mao Zedong's successor, but as a sign that his position had not been adversely affected, Kang Sheng was named one of five vice chairmen of the Party. In his final years, Kang became involved in the Criticize Lin, Criticize Confucius campaign that was created by the beneficiaries of the Cultural Revolution to oppose Zhou Enlai and other veteran officials in the struggle over who would succeed Mao Zedong. Kang was initially active in supporting Jiang Qing, perhaps seeing her as a successor through whom he would exercise power. Kang subsequently shifted tack when it became apparent that Jiang was out of favor with Mao, even going so far as to denounce her as having betrayed the Party to the Kuomintang during the mid-1930s, notwithstanding his support for her when the same charge had been leveled 30 years earlier in Yan'an. Kang's final political act came only two months before his death, when he warned Mao Zedong that Deng Xiaoping opposed the Cultural Revolution and should be purged again, advice that Mao ignored. Kang also left a lasting imprint on China's foreign policy. As MacFarquhar writes, "[t]he dual role of Kang Sheng in Mao's campaign against revisionism at home and abroad symbolized the close relationship between Chinese domestic and foreign policy." Kang's contribution to the dispute with the Soviet Union about de-Stalinization has been described above in connection with his efforts to insinuate himself with Mao and developing the ideological origins of the Cultural Revolution. Perhaps Kang's most important influence over Chinese foreign policy came during the Cultural Revolution itself, when he was instrumental in developing Chinese support for the Khmer Rouge regime in Cambodia. While the mainstream of the CPC leadership supported Prince Norodom Sihanouk as Cambodia's anti-Western and anti-imperialist leader, Kang argued that Khmer Rouge guerrilla leader Pol Pot was the real revolutionary leader in the Southeast Asian nation. Kang's backing of Pol Pot was an effort to back his own cause within the CPC, as his touting of Pol Pot as the true voice of the Cambodian revolution was in large part an attack on the Chinese Foreign Ministry, whose pragmatic support for Prince Sihanouk's regime was thereby presented as reactionary. As a result of his success in this, the Pol Pot regime came to power and the Khmer Rouge became the recipient of Chinese aid for years to come, prolonging the life of that movement with tragic consequences for Cambodia. Kang Sheng died of bladder cancer on December 16, 1975. He was given a formal funeral, attended by every member of the Politiburo except Mao, who did not attend funerals at this stage, and Zhou Enlai and Zhu De, who both were too weak to attend. Marshal Ye Jianying delivered a eulogy in which he praised Kang as "a proletarian revolutionary, a Marxist theoretician, and a glorious fighter against revisionism." you four people have played an extremely negative role in the liberation of thought, the role of a brake. As far as I'm concerned, this is because you have come too much under the influence of people like Kang Sheng. … Kang Sheng passed his time reading between the lines looking for "allusions" without taking account of the real subject of articles and the general idea. He made a sort of talent of looking for a particular point he could attack. He had learned this from Stalin, from Andrei Zhdanov and the KGB, and acted thus from the time of the Yan'an era. As fear of Kang subsided following the arrest of the Gang of Four and the return to power of Deng Xiaoping, criticisms of Kang Sheng grew and a special case group was established to investigate Kang's career. In late summer 1980, the special case group reported to the CPC Central Committee. In October 1980, just in advance of commencing the trial of the Gang of Four, Kang Sheng was posthumously expelled from the CPC and the Central Committee formally rescinded Marshal Ye Jianying's eulogy. ^ Byron & Pack, p. 35-7; Roger Faligot & Remi Kauffer (translated from the French by Christine Donougher), The Chinese Secret Service (Paris: Laffont 1987; Translation London: Headline 1989), p. 10. ^ Byron & Pack, p. 33; Faligot & Kauffer, p. 10; Edgar Snow, Red Star Over China (New York: Grove Press, 1938, 1973 ed. ), p. 473-474; Vladimirov, Peter, The Vladimirov Diaries, Yenan, China: 1942-1945, (Garden City: Doubleday, 1975), p. 76. ^ Faligot & Kauffer, p. 12-14. ^ Byron & Pack, p. 40-41. ^ Faligot & Kauffer, p. 20-21. ^ Vladimirov, p. 77. Faligot & Kauffer, p. 15, name the town where Kang taught as that where his family then lived, Zhucheng. ^ Byron & Pack, p. 54-5; Faligot & Kauffer, p. 21. ^ June Chang & John Halliday, Mao: The Unknown Story, (London: Jonathan Cape, 2000), p. 275. ^ Ruan Ming (translated from the Chinese by Nancy Liu, Peter Rand and Lawrence R. Sullivan), Deng Xiaoping: Chronicle of an Empire, (Boulder: Westview Press, 1994), p. 259. ^ Byron & Pack, p. 59. ^ Byron & Pack, p. 61; Simon Leys (translated from the French by Carol Appleyard & Patrick Goode), The Chairman's New Clothes (London: Allison & Busby, 1977), p. 247; Snow, p. 474. ^ See Harold R. Isaacs, The Tragedy of the Chinese Revolution (Stanford: Stanford University press, 1938, rev. ed. 1951), p. 175-185. ^ Byron & Pack, p. 73. ^ Faligot & Kauffer, p. 70. ^ Byron & Pack, p. 76. ^ Byron & Pack, p. 77. ^ Jacques Guillermaz (translated from the French by Anne Destenay), A History of the Chinese Communist Party 1921-1949 (Paris: Payot, 1968; English translation New York: Random House, 1972), p. 174-180. ^ Byron & Pack, p. 79; Faligot & Kauffer, p. 61-2. ^ Byron & Pack, p. 81. ^ Byron & Pack, p. 85. ^ Jonathan D. Spence, The Gate of Heavenly Peace: The Chinese and Their Revolution, 1895-1980 (London: Faber & Faber, 1982), p. 230-2. ^ Byron & Pack, p. 103. ^ Byron & Pack, p. 115. ^ Huang Jing, Factionalism in Chinese Communist Politics, (Cambridge: Cambridge University Press, 2000), p. 111 f13. ^ Roderick MacFarquhar, The Origins of the Cultural Revolution, Vol. 3: The Coming of the Cataclysm 1961-66 (Oxford: Oxford University Press, 1997), p. 291. ^ Byron & Pack, p. 119. ^ See Gullermaz, p. 252-263; Harrison E. Salisbury, The Long March (London: Macmillan, 1985). ^ Byron & Pack, p. 122-3. ^ See Robert Conquest, The Great Terror: A Reappraisal (Oxford: Oxford University Press, 1990). ^ Byron & Pack, p. 125-6; Faligot & Kauffer, p. 102-3, 115-117. ^ Byron & Pack, p. 125-6. ^ Byron & Pack, p. 131. ^ Faligot & Kauffer, p. 102. ^ Byron & Pack, p. 142-3. ^ MacFarquar, Origins of the Cultural Revolution, Vol. 3, p. 291. ^ Byron & Pack, p. 148-9. ^ Byron & Pack, p. 150. ^ Byron & Pack, p. 150-151. ^ Faligot & Kauffer, p. 160-161. ^ Vladimirov, p. 30. It should be noted that this book by a Russian Comintern agent, reflecting the period in which it was published, expresses strong bias, and takes positions on individuals that suggests politically motivated editing decades later. ^ Chang & Halliday, p. 275. ^ Byron & Pack, p. 174-176. ^ Byron & Pack, p. 189. ^ Byron & Pack, p. 182-3. ^ Byron & Pack, p. 195-6. ^ Li Zhisui (translated from the Chinese by Tai Hung-chao), The Private Life of Chairman Mao, (London: Chatto & Windus, 1994), p. 397. ^ Byron & Pack, P. 209-210. ^ See Jacques Guillermaz (Translated from the French by Anne Destenay), The Chinese Communist Party in Power, 1949-1976 (Boulder: Westview Press, 1976) p. 98-110. ^ Faligot and Kauffer p. 270-273. ^ Byron & Pack, p. 221. ^ For an account of the context and content of the speech, made to the Twentieth Congress of the Communist Party of the Soviet Union on 25 February 1956, see Archie Brown, The Rise and Fall of Communism, (London: Bodley Head, 2009) p. 240-243. ^ Roderick MacFarquar, The Origins of the Cultural Revolution, Vol. 1: Contradictions Among the People 1956-1957, (New York: Columbia University Press, 1974) p. 148. ^ Maurice Meisner, Mao's China and After: A History of the People's Republic, (New York: The Free Press, 3rd edition 1999) p. 170. ^ Byron & Pack, p. 224-225. ^ Byron & Pack, p. 245. ^ Guillermaz, The Chinese Communist Party in Power, 1949-1976, p. 316. ^ Byron & Pack, p. 245-247. ^ Guillermaz, The Chinese Communist Party in Power, 1949-1976, p. 317. The Chinese declined an invitation to send delegates to the CPSU's Twenty-Third Congress, which Guillermaz describes as "the last important gesture" of disdain for Soviet policy before the Cultural Revolution. Ibid., p. 323. ^ "A Proposal Concerning the General Line of the International Communist Movement" (June 14, 1963), as quoted in Guillermaz, The Chinese Communist Party in Power, 1949-1976, p. 329. ^ Guillermaz, The Chinese Communist Party in Power, 1949-1976, p. 329. ^ MacFarquar & Schoenhals, p. 12, discussing the significance of The Polemic on the General Line of the International Communist Movement published by the Party in 1965. ^ "Resolution on Certain Questions in the History of our Party since the Founding of the People's Republic of China, adopted by the Sixth Plenary Session of the Eleventh Central Committee of the Communist Party of China on June 27, 1981," paragraph 19 (hereinafter cited as "Resolution of June 27, 1981"), reproduced in Resolution on CPC History (1949–1981) (Beijing: Foreign Languages Press, 1981), p. 32. ^ MacFarquar, The Origins of the Cultural Revolution, Vol. 3, p. 296. ^ MacFarquar & Schoenhals, p. 32-33. ^ "Resolution of June 27, 1981," paragraph 21, reproduced in Resolution on CPC History (1949–1981), p. 31. ^ MacFarquar & Schoenhals, p. 54-55. ^ Yue Daiyun and Carolyn Wakeman, To the Storm: The Odyssey of a Revolutionary Chinese Woman (Berkeley: University of California Press, 1985), p. 148. ^ Kang apparently said about Nie "I've known since back in Yan'an that Nie Yuanzi is not a very good person. But now we will support her, even if she is a f***ing turtle's egg [hundan wangbadan]." MacFarquar & Schoenhals, p. 54-55. Kang Sheng had supported Nie Yuanzi in a prior attack on Lu Ping and other alleged "capitalist roaders" at Beijing University, which Peng Zhen and others had been able to fend off. As MacFarquar writes, on that occasion "[e]ven Kang Sheng's intervention could not save Nie from criticism." MacFarquar, The Origins of the Cultural Revolution, Vol. 3, p. 638n. ^ Yue & Wakeman, p. 167. ^ MacFarquar & Schoenhals, p. 250-252. ^ MacFarquar & Schoenhals, p. 282-283. ^ Michael Schoenhals, "The Central Case Examination Group, 1966-1979," China Quarterly No. 145 (March 1996), p. 91-103. ^ Byron & Pack, p. 368. ^ Quoted in Meisner, p. 348. ^ Bonavia, p. 190; Byron & Pack, p. 373-375. ^ Byron & Pack, p. 389-393. ^ MarFarquhar, The Origins of the Cultural Revolution, Vol. 3, p. 297. ^ Byron & Pack, p. 356-7. ^ Byron & Pack, p. 409. ^ The materials assembled by the special case group were passed to Ma Zhongyang and Li Kan, who as "Zhongkan" published Kang Sheng Pingzhuan [A Critical Biography of Kang Sheng] in 1982. Byron & Pack, p. 416. This page was last edited on 8 April 2019, at 05:35 (UTC).